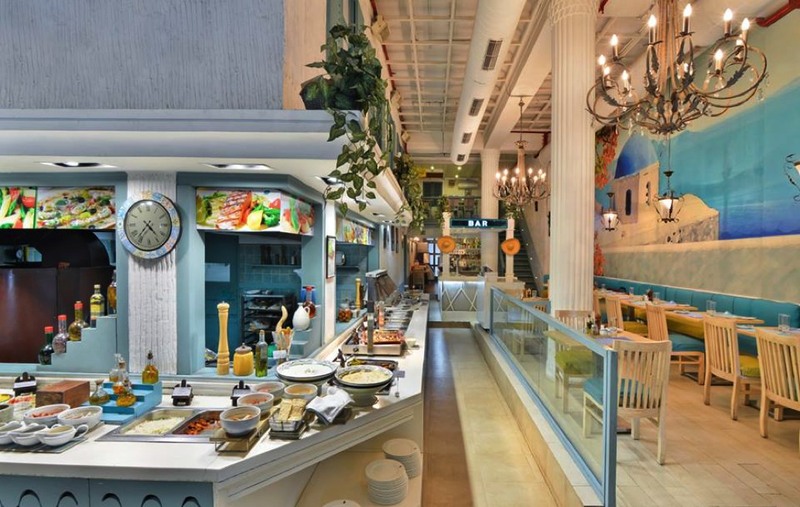 Fresc Co located in Janpath, Connaught Place and Ambience Mall, Gurgaon is the perfect place to dine-in for couples & family especially when Valentine’s Day is coming. Whether you are planning to surprise your beloved or your best friend or family, a meal at Fresc Co will ensure you have a perfect time. Fresc Co has curated a special menu for this Valentine’s Day and Team ChicLifeByte gets you on exclusive sneak peak of the same. You ought to taste their heart shaped Gnocchi, Fish Fingers along with Sip of Love mocktail and when this time round we entered the Janpath outlet, we saw a group of 50 foreigners gathered there. Upon inquiring, the staff told that they have prepared a special buffet of vegan & gluten free dishes for them. They danced & enjoyed as much as we on our food journey. We were then greeted by Mr. Deepak Kumar, Restaurant Manager who made sure our experience was perfect! 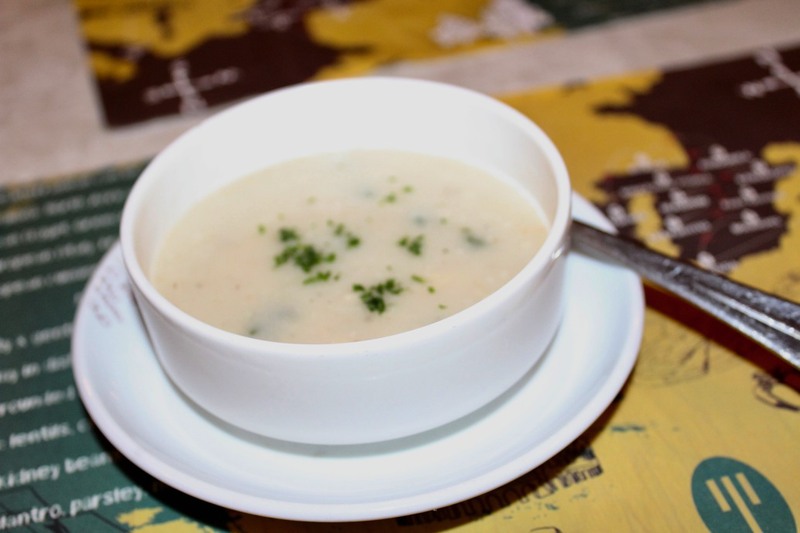 We started with Thyme Scented Cream of Chicken Soup which had fresh cream with chicken pieces & thyme herbs. It was delicious and made for the perfect start. 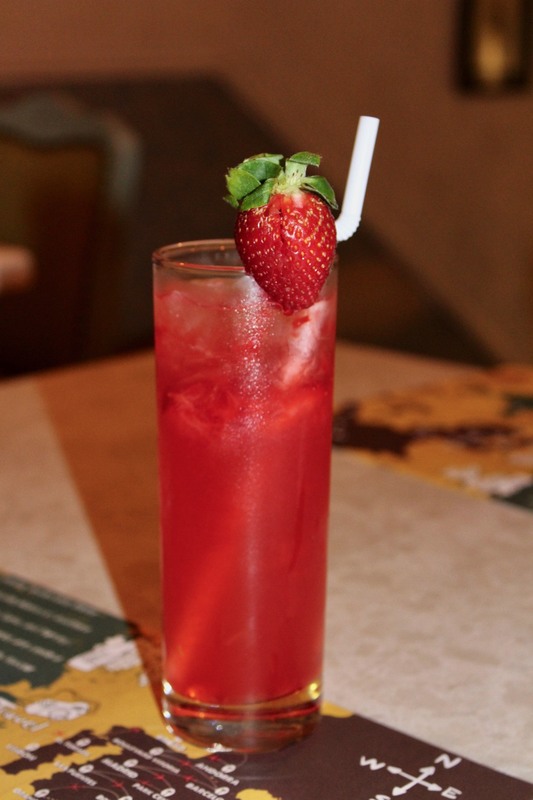 Next was a Valentine’s special mocktail called Sip of Love. Made using strawberry crush, cucumber syrup, strawberry pieces, mint and topped with soda & ice, it was indeed very refreshing. Most of the strawberry based mocktails are generally very sweet but this was perfectly balanced. 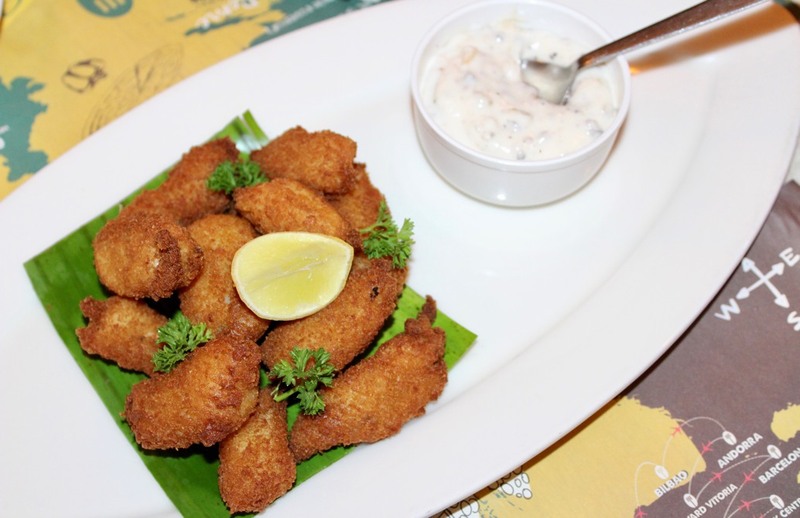 The Crumbed Fish Fingers served with delicious white tartar sauce & garnished with lemon & parsley leaves were tender, soft and juicy. They were very delicious with a lovely taste and it was a fun experience finishing and relishing all the fingers. 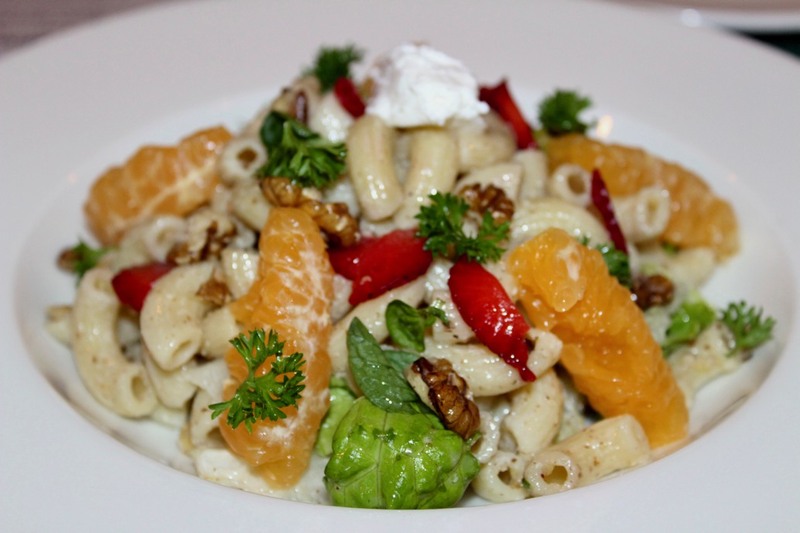 Melt My Heart Pasta Salad with aromatic Feta Cheese & Citrus Orange Walnut Vinaigrette had the perfect Valentine’s drizzle of strawberry, crunchy walnuts & oranges with fresh lettuce & parsley with feta cheese layering on the delicious pasta. It was refreshing and the flavours came out really well. Loved it! 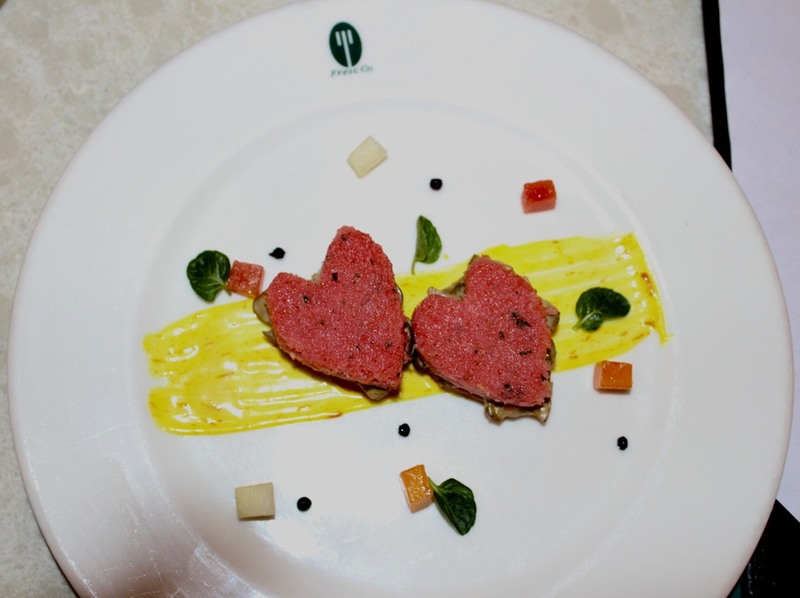 The Heart Shaped Butter Beetroot Gnocchi had potato mash & beetroot puree together baked & blended with semolina & cheese. It was cutely cut in heart shape with mushroom stuffing, cheese, herbs & spices and decorated with fruit pieces like papaya & watermelon to grace the Valentine’s love season with nice, soft, mushy & lovely feeling. The red colour is due to beetroot. This dish is a MUST TRY for sure! How could our visit be complete without a pizza? So our next dish was Delightful Veggie Blast Pizza which had veggies like mushrooms, corn, peppers, tomato, onions, broccoli, zucchini and black olives on a crispy base. We totally relished it! 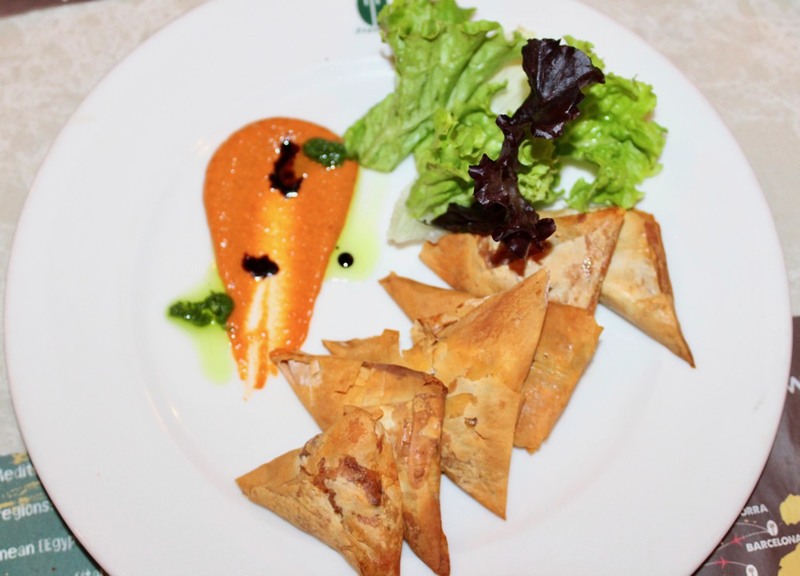 Coming to the main course, we first tried Vegetable Filled Phyllo Pockets on the bed of Tuscan ragout & wrapped lettuce with Muhammara sauce. Made of rice & filled with mix veggies like broccoli, zucchini, mushrooms and Parmesan cheese, they were light, refreshing and very different. 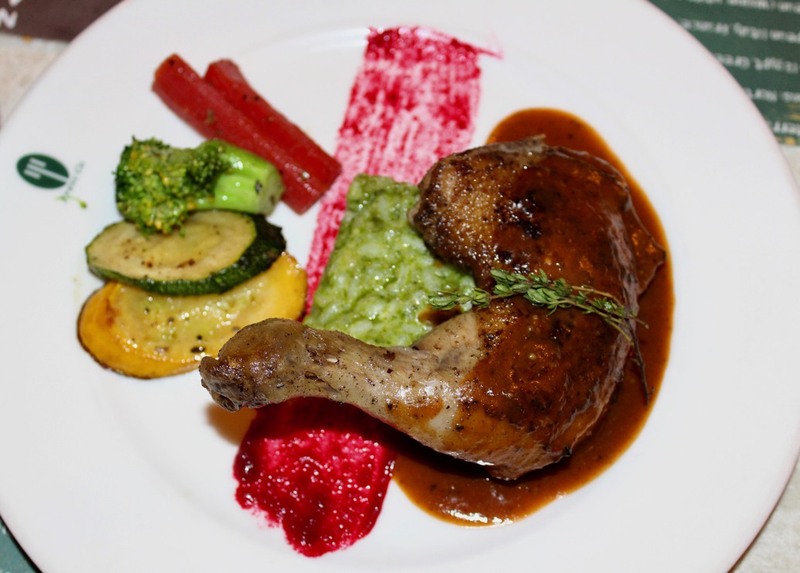 The Half-Day Braised leg of Chicken Confit– with pesto risotto timbale & star anise sauce was relishingly delicious, juicy, succulent, fleshy and mildly spiced. The chicken was well made however for me the highlight has to be the star anise sauce. I recommend trying this one as I enjoyed eating this completely! 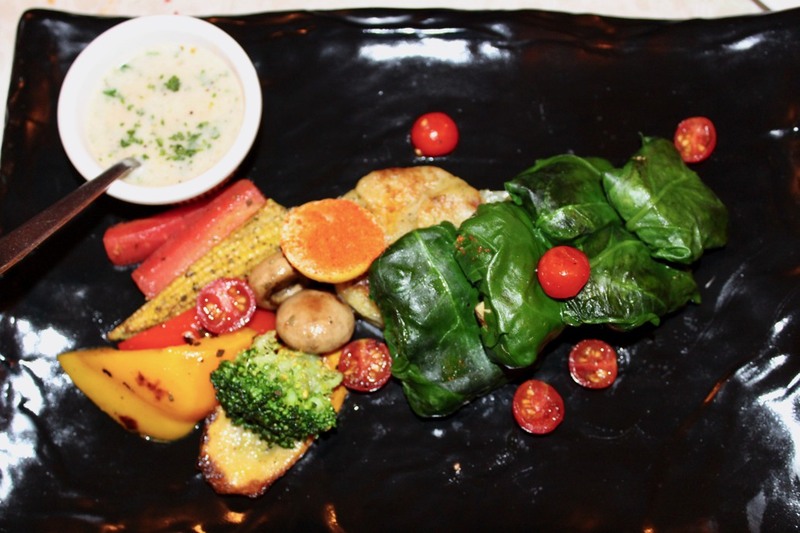 Lastly was the Baby Spinach Wrapped Grilled Sole Fish with butter vegetables, anna potatoes and lemon beurre blanc. The fish was juicy & fresh being wrapped in nutritious baby spinach. The juicy sole fish was served with a green salad of bell peppers, cherry tomatoes and baked potato mash. 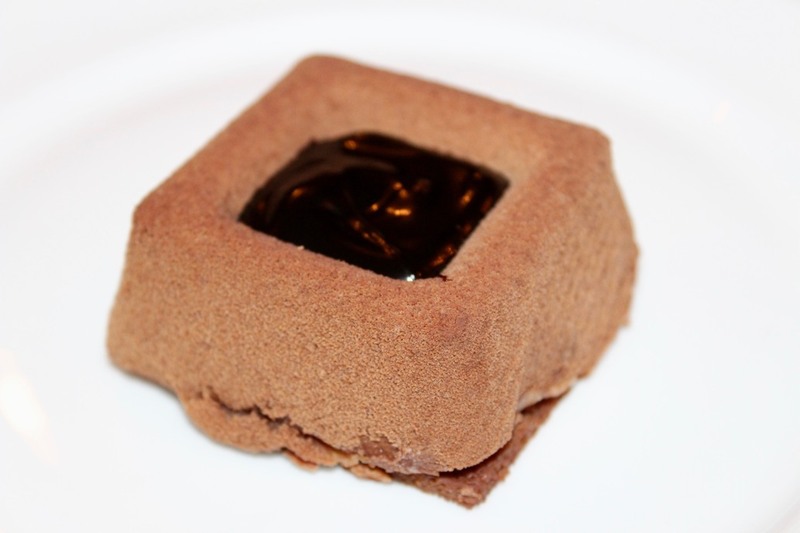 For desserts, Monte Cristo Chocolate Pastry gave a nice fruitful end to our Valentine meal. 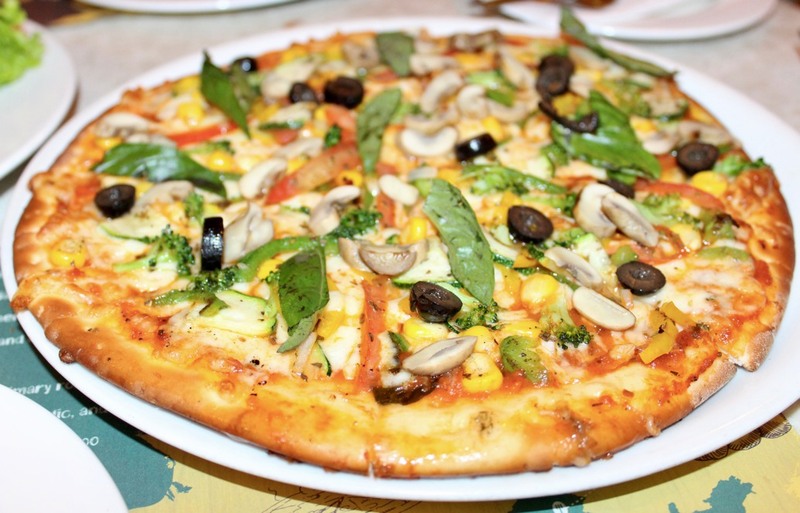 We totally savoured the food at Fresc Co and delightfully relished it. As an ardent supporter of healthy eating, Fresc Co brings you the best quality market-fresh ingredients and authentic recipes from the Mediterranean. The Valentine’s menu is priced at just Rs. 899 + taxes and is the perfect way to delight you and your Valentine.